Maisie, also titled The Adventures of Maisie, was a situation comedy series broadcast from 1945 to 1953. 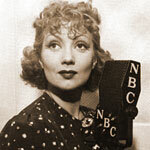 Ann Sothern starred as the Brooklyn beauty, Jane-of-all-trades Maisie Ravier in the title role. Underemployed, Maisie was always looking for a job. She was also always on the lookout for her Mr. Right. The supporting cast included Averback, Conreid, Leeds, McGovern, Lurene Tuttle, Ben Wright, Sandra Gould and Jeffrey Silver. The show popularized a catch phrase in the 1940s, "Likewise, I'm sure," which was Maisie's signature answer to everything.